This set demonstrates a wide variety of physical science topics including the resolution of forces on an inclined plane, kinetic and potential energies, uniform and accelerated motions, and the friction between two surfaces. Students can explore and determine the coefficients of static and sliding friction and also verify normal and frictional components of the force exerted by the plane. 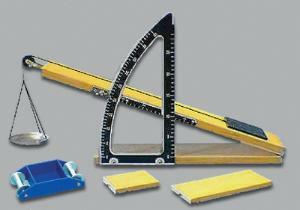 The 10 x 60 cm wooden inclined board can be set at any angle between zero and 45°, and angle measurements can be made directly through the two scales on the included protractor.